The periodic table is chemistry’s holy text. Not only does it list all of the tools at chemists’ disposal, but its mere shape – where these elements fall into specific rows and columns – has made profound predictions about new elements and their properties that later came true. But few chemists on Earth have a closer relationship with the document than Dawn Shaughnessy, whose team is partially responsible for adding six new elements to table’s ranks. Shaughnessy leads a team of real-life alchemists. You might be familiar with alchemy as a medieval European practice where mystics attempted to transmute elements into more valuable ones. But rather than turn the element lead into gold, Shaughnessy and her team turned plutonium into flerovium. Shaughnessy’s parents encouraged her to pursue science from a young age – her father was an engineer, and she had an electronics kit as well as a chemistry set as a child. She’d first thought about doing orthopedic research but didn’t want to cut people open, she explained to me, and chemistry was a natural fit. But when she arrived at the University of California, Berkeley as an undergraduate, she learned that chemistry could be more than just mixing liquids in beakers. She could create the atoms themselves. She’s presents herself as more of a Californian than medieval European alchemist, of course. We spoke in a board room on the campus of Lawrence Livermore National Lab, located in a valley surrounded by wind turbine-studded golden hills in Livermore, California. She happily chatted chemistry but occasionally veering off to chat about Disneyland or her favourite film franchise, Star Wars; she wore a BB-8 lanyard around her neck. As the Cold War was coming to an end, the United States nuclear enterprise was shrinking, Shaughnessy explained, leaving fewer options for a nuclear chemist. So she found herself working at the national labs – first at the Lawrence Berkeley National Laboratory working on environmental research, then at Lawrence Livermore National Laboratory where she could pursue her real passion: “giant accelerators and beams and things smashing together,” she said. Creating new elements is no longer magic. An element’s atom has a central nucleus, which contains protons and neutrons, surrounded by electrons. The combined number of protons and neutrons determines an element’s mass, while the number of protons minus the number of electrons determines its electric charge. But the number of protons alone determines an element’s identity – so making a new element requires finding a way to force more protons in an element’s nucleus. Elements up to uranium, which has 92 protons, exist in nature, while 93 through 118 must be made in laboratories. The largest ones with the most protons require high-energy experiments and an international collaboration of scientists. Here in the United States, Dawn and her team mostly decide what chemical reactions they’ll attempt, prepare the target materials, and research detector technology. They send the material to Russia, where scientists operating a particle accelerator at the Joint Institute for Nuclear Research (JINR) in Dubna slam the target with a continuous beam of lighter elements. Resulting atoms fly out and are separated from any background material not part of the reaction into a detector. The detector measures how these elements lose subatomic particles to radioactive decay, creating a signature determining whether they’ve created something new or not. It’s not easy. The special isotopes used – atoms of differing isotopes have the same number of protons but differing numbers of neutrons – are rare. Only a few atoms of the final product remain from a reaction that requires several milligrams or grams of input. Then, both teams need to perform independent analyses to confirm that each saw the real thing. And the elements last for just a few seconds before breaking apart. “As we start putting more protons in, there’s this balancing act between the force that holds them together and the positive charge that wants to drive them apart,” said Shaughnessy. But why study all of this? It’s unclear whether humans can ever use elements that last no longer than a few seconds before decaying – they’re not for bombs or for power. They’re to help scientists test the limits of physics and chemistry theory, to better understand atoms and how our universe decided that matter should behave. These days, heavy element research represents an unlikely collaboration between American and Russian scientists. Pioneering heavy element researchers Glenn Seaborg from the United States and Georgy Flyorov of Russia disliked one another due to Cold War tensions, explained Shaughnessy, and competition between their groups was tense. But in 1989 as the Cold War was coming to an end and the newer elements were getting larger, Flyorov met Livermore physicist Ken Hulet at a conference. They realized they had tools each could benefit from, and struck up a collaboration. “Science is what it is,” said Shaughnessy. Shaughnessy has now travelled to the accelerator at JINR several times – though she told me she was utterly unprepared for Russia’s February cold on her first visit, standing out in a bright red Tampa Bay Buccaneers parka. Shaughnessy’s team, as well as the Russian team’s work, has assisted in discovering six elements, four of which received official names just two years ago: nihonium, named for Japan, which also hosts a nuclear chemistry program; moscovium, named for Moscow; tennessine, named for Tennessee, the location of Oak Ridge National Laboratory; and oganesson, named for the well-known Russian nuclear chemist who led Russia’s team, Yuri Oganessian. Shaughnessy’s team also helped discover flerovium, named for Flyorov. Will there be any more new elements? 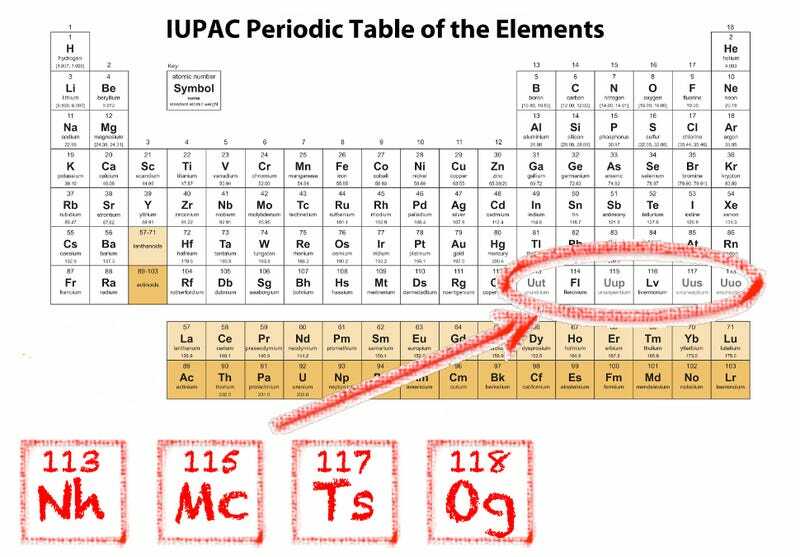 If you look at the periodic table, oganesson, element 118, seems to sit at the rightmost corner of the bottom row. It appears as if the periodic table has been completed, and previous searches for element number 120 has failed. But there’s no obvious reason these new elements shouldn’t exist, and Russia is updating JINR’s accelerator to launch into searches for 119 and 120. In the meantime, Shaughnessy has moved on to other projects studying nuclear reaction rates studying other heavier elements, this time relevant both to astrophysics and to national security. Her team also develops tools to actually perform chemistry with heavier atoms by capturing them, putting them into a solution, and making previously inaccessible measurements. Creating the heaviest elements has become a “fun hobby on the side,” she said – not part of her daily routine. But Shaughnessy doesn’t appear on postage stamps like Oganessian does in Russia. She gets the feeling that people are afraid of science in this country – she’s heard conspiracies that scientists were stockpiling element 114 at area 51 in order to fuel UFOs. But she stressed that basic research like this is what leads to other advances. “The iPhone didn’t get made overnight,” she said.